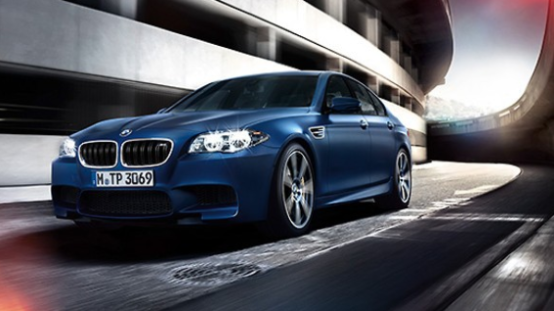 Available at Budds’ BMW Oakville, the BMW M5 has been designed for maximum performance. From the striking front with broad air intakes and the new M double kidney grille with M emblem to the distinctive side skirts and the diffuser at the rear: every single detail ensures that the vast potential of this vehicle comes into its own. One particularly sporty feature is the optional Competition Package, offering an impressive racy look and even greater performance. Continue reading this page to learn more about the BMW M5 at Budds’ BMW Oakville. The BMW M5 Sedan. An elegant athlete whose impressive prowess is apparent at first sight. Vehicle design that uses only the highest standards as a yardstick. The front view alone, with the redesigned M double kidney grille and the optional Adaptive LED Headlights, reveals the striking character of a powerful athlete in the exclusive body colour Frozen Blue metallic. The broad track width of the M high-performance chassis is expressed to particularly good effect in combination with the exclusive 20” light alloy wheels of the Competition Package. Matching the distinctively athletic appearance of the BMW M5 Sedan and ideally suitable for transferring the tremendous power of this sports car safely onto the road: an exclusive selection of high-quality M light alloy wheels in 20” with mixed tires is ready and waiting for you. The interior of the M5 is geared towards controlling the performance of this sports car while simultaneously enjoying every kilometer you drive it. The ergonomically designed cockpit of the BMW M5 Sedan stands for perfect teamwork between driver and vehicle. High-quality M leather seats, available in an exclusive selection of upholstery colours ranging from Black, through Silverstone to Sakhir Orange, feature moulded side supports to hold the body ideally in position in any driving situation, without restricting the driver in any way. In the BMW M5 Sedan, every detail of the interior blends perfectly into the overall composition – for a sporty driving experience with no compromises for the driver. How Does the M5 Drive? This BMW M5 has been developed on the racetrack and is perfect for everyday use. It is the perfect combination of high performance and practicality for everyday usage. Figures that speak for themselves: with 560 hp and a torque of up to 500 lb-ft, the BMW M5 Sedan accelerates from 0 to 100 km/h in only 4.3 seconds. And with the Competition Package there is even an output of 575 hp available – and an acceleration of 4.2 seconds from 0 to 100 km/h. For more information about the BMW M5 at Budds’ BMW Oakville, please feel free to continue browsing through our website. We can be reached at (905)845-3577 to schedule a test drive or you can fill out our contact form.